by alias Nante to 1st Special Forces Battalion in his surrender. CAMP OSITO D. BAHIAN, Malaybalay City, Bukidnon - Three NPA terrorists surrender to the Army Battalions under the operational control of 403rd Infantry Brigade, 4th Infantry Division, as they continue to intensify their focused military operations in the province of Bukidnon. Alias Nante of Guerilla Front 68 surrendered to the 1st Special Forces Battalion on January 14, 2018, bringing along one bolt action caliber .223 rifle with ammunition, one cal .45 pistol with ammunition, and two Improvised Explosive Devices (IEDs). 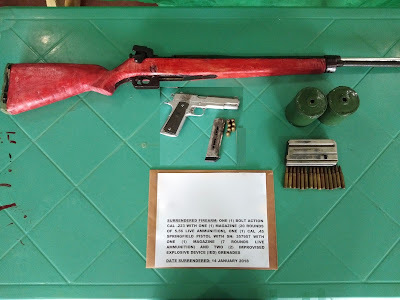 Alias Pipoy of Guerilla Front 53 also surrendered to the 8th Infantry Battalion on the same day bringing along his M16 rifle with live ammunition. Meanwhile, alias Janjan surrendered to the 88th Infantry Battalion on January 15, 2018, bringing along his M16 rifle with ammunition. The true name of said members of the NPA terrorist organization is withheld for security purposes. During their custodial debriefings, the former NPA terrorists disclosed the continued hardships, discrimination, and the false promises of their leaders that they continue to experience within the terrorist group. Hence, they decided to lay down their arms, go back to the folds of the law, and live a normal and peaceful life with their families. Brigadier General Eric C. Vinoya, AFP, the Commander of 403rd Infantry Brigade, welcomed the surrender of the three NPA terrorists and assured them of their security and well-being. He also called upon the other NPA members to surrender or face the consequence of being hunted down as the 403rd Infantry Brigade will have no let up in its focused military operations. "I welcome and appreciate the surrender of these three NPA members who recognized the value of their lives more than the futility of their ill-motivated terroristic acts. We assure you that we will look after your safety and well-being as you live a normal and peaceful life with your families," said Brigadier General Vinoya. "To all those who still remain with the NPA terrorist group, it is not too late to follow the path of your comrades who laid down their arms. The government has prepared the necessary assistance for all of you should you decide to go back to the folds of the law including livelihood and cash assistance, employment, and housing benefits. Otherwise, you will have to face the consequences, as we will have no let up in our focused military operations. We will hunt you down," he added.